For any organization who wants to grow in today’s economy, employee engagement should be a key priority. Whether private, public or not-for-profit, employees are more likely to produce and deliver a higher quality of work when they’re engaged, motivated and happy. Being able to internally communicate effectively and clearly is a key component to any employee training program. Which is why businesses are turning to corporate video to deliver training and development, facilitate collaboration among colleagues and empower senior management teams to communicate with employees. Here are four great benefits of taking your employees behind the scenes using corporate video. Video plays an increasing role in our daily lives; smartphones and tablets have made it easily accessible anytime…anywhere. And since next-generation employees have grown up with video at their fingertips; it has led to a higher demand for video within businesses, both as a communication tool as well as a way to access content. Providing modern technologies to employees in the workplace will ensure they are able to fully engage and be productive with colleagues, boost communications and increase collaboration throughout the entire company. 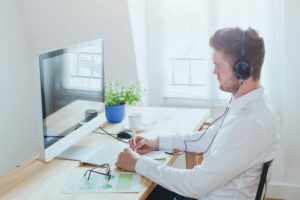 Video allows employees to engage with content by creating conversation starters, increasing interaction on topics of interest, and enhancing collaboration among remote teams. It offers companies the ability to truly empower their staff, ensuring they feel invested within the company that is actively developing their knowledge base. Plus, video catches a greater mind-share. Studies show that employees are 75 percent more likely to watch a video than to read emails or documents. It’s clear to see, when companies invest in developing their skills through video, employees feel more engaged and motivated. In larger organizations, the CEO or Managing Director often has little visibility to the wider workforce. Though the name may be known, little else is. As leaders struggle with this problem, communication and company vision can suffer. Corporate video offers senior management a simple way to engage with staff by offering a personal way to gain a behind the scenes look into company culture. This transparency, in return, builds stronger relationships and results in lower turnover and absenteeism rates. Using corporate videos for training purposes is a valuable way to allow employees access to content at their own pace, at any stage of the training regimen. This also offers flexibility for remote workers who are away from the office yet still require access to training. And considering the majority of Americans carry a smartphone (77%), they can easily view video content when they’re away from the office – a huge benefit for today’s modern (and millennial) employee. Corporate video offers employees a behind the scenes look at company culture. As a success vehicle for business communications, you have the chance to boost engagement, empower employees and deliver an amazing experience. Every time. At Shamrock Communications, we help businesses create exceptional employee experiences through video. Go beyond the power point to deepen employee engagement. Ready to get started? Let’s create an experience that strengthens connections and grows business. For more information on our services, visit our services page and contact our team with any questions today.